The adaptive KW DDC ECU coilovers allow adjustment within the TÜV-tested lowering range. The dirt-resistant trapezoid thread and the composite collar allow years of accessible adjustability and ease of use. Lowering can be done via the composite spring collar on the shock body or on the height adjustable rear perch in the rear of the vehicle. No matter where in the world, sporty drivers, car manufacturers and refiners rely on our KW technology Made in Germany . Each KW coilover kit is produced at our headquarter located in Fichtenberg, Germany. During the production process each kit is subjected to extensive stress tests and must meet the high quality standards set by KW management and surpass OEM quality. Over 4600 applications come supported with a multi-year warranty. A 5 year warranty is provided when the kit is installed at one of KW's specialist dealers. Currently KW DDC ECU coilovers with App-control are available for Audi, BMW, Mercedes-Benz, Porsche, Volkswagen and Range Rover Evoque. This button allows the user to select between the different KW DDC driving modes Comfort, Sport and Sport+ directly from the cockpit. Here the KW DDC button changes the color matching the KW DDC App. Made in Germany - the KW DDC (Dynamic Damping Control) coilovers with ECU (Electronic Control Unit). 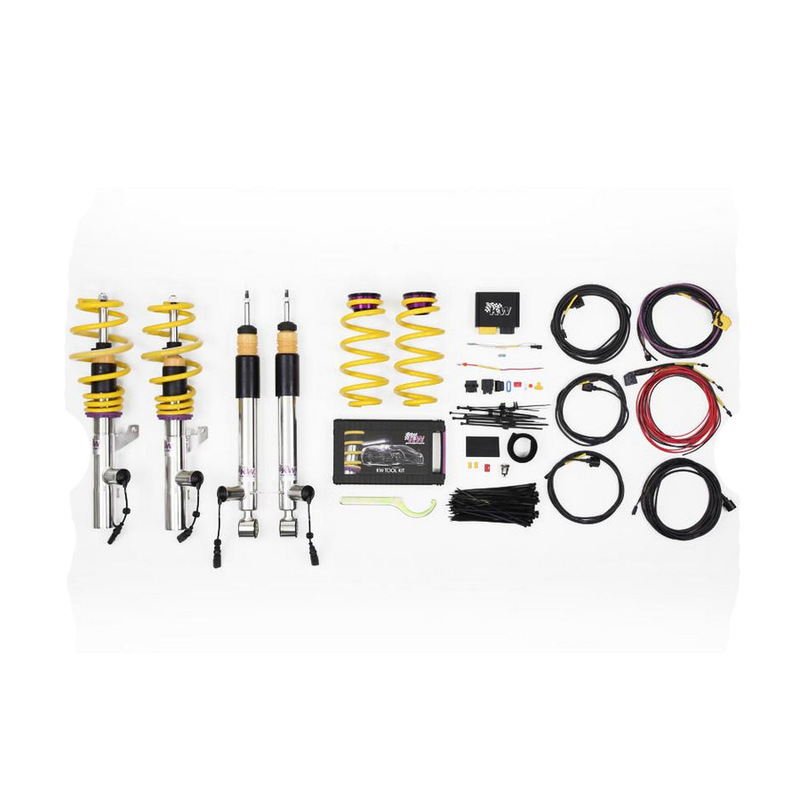 The coilovers with its electronically controlled dampers enable an intelligent suspension setup via App-control. Currently available for numerous vehicles without factory adaptive suspension.